Stéphany Carle : Horses are her passion, she lives to ride! From a family of horse people, Stéphany`s great grandfather was a horse trader and her two grandfathers were a farrier and a harness racer. 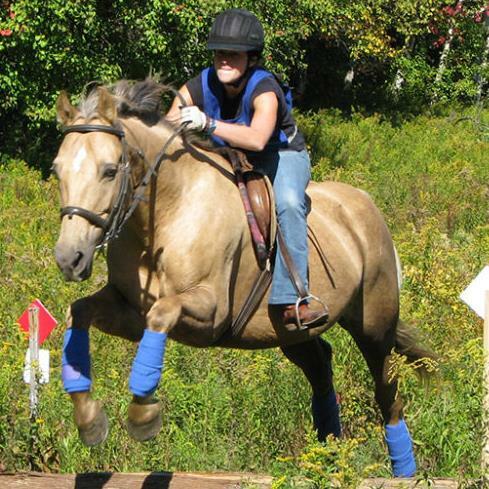 Her passion for horses is well anchored and combined with a wide vision of the equestrian world. Since a very young age her dream was to have her own horses at her own ranch where she could share her passion for horsemanship. 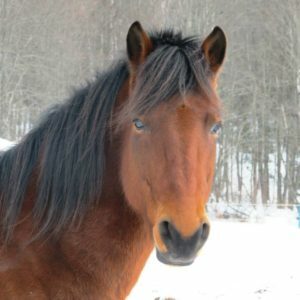 She opened her riding school in 2004 in a shared space, and in 2006 found the perfect place to build her ranch in Huberdeau, QC. For many years the project involved recycling materials, renovating, building, shoveling and sowing the seeds for her dream. Over the years Stéphany has played many different roles on the farm. She has honed her craft with training in Quebec, in France, in North Carolina and in Australia. She had refined her techniques of management and maintenance of the ranch as much as training and teaching with horses. Her vision has been influenced by Monte Foreman, John Lyons, Sally Swift, Stéphane Bigo, Jean de Chatillion, Michel Ladouceur and many others. Furthermore, having been attracted by First Nations techniques and healing horses with medicinal herbs, she planted a garden at the Academy. Horses are considered by many cultures to be a connection with the gods. Stéphany sees the horse as a connection with the divine within herself, a link which is grounding and encourages a privileged relationship with nature. While technique is important, feeling is too! Teaching students since our doors opened in 2004, “Loulou” is the matron of our school. A Quarter Horse mare standing 15h1, she was born January 8 1996 with an ashen palomino coat. Expressive and generous, she possesses a lively gait and remarkable endurance. 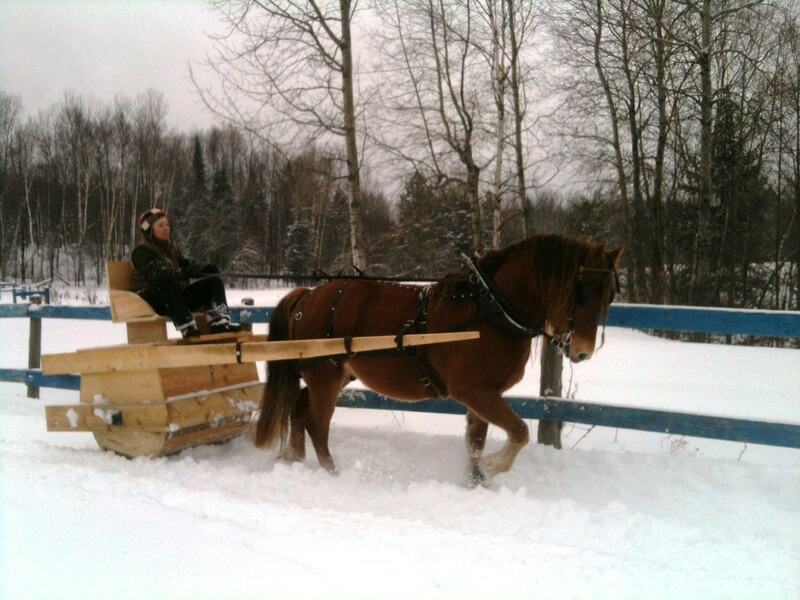 Certified Level IV Western, she excels at jumping and is our harness horse of choice for ploughing our winter trails. 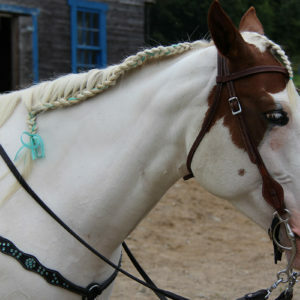 Born May 1 2004, Wicca is a certified Level IV tobiano paint mare standing 15h2. Her temperament is calm and giving, her gentleness and comfortable gait make her a rare pearl. 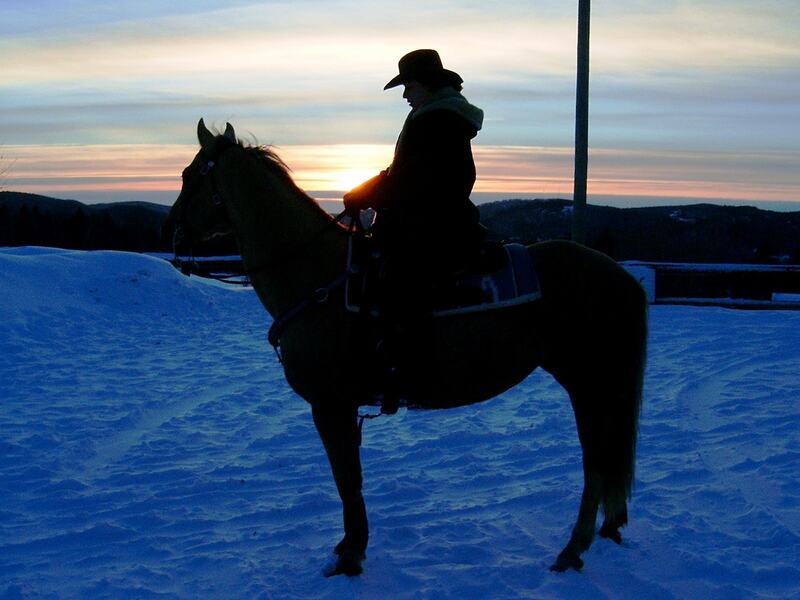 She has many talents, particularly in T.R.E.C obstacles, western riding and harnessing. Riders easily fall for her charms. 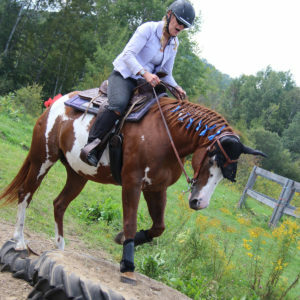 Standing 15 hands, Reba is also a tobiano paint mare. 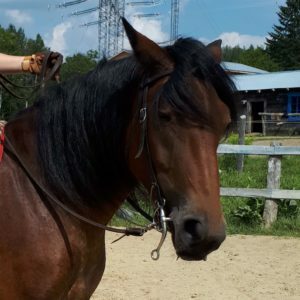 Affectionate and calm, she will help you discover western riding while cradled in her gentle gait. 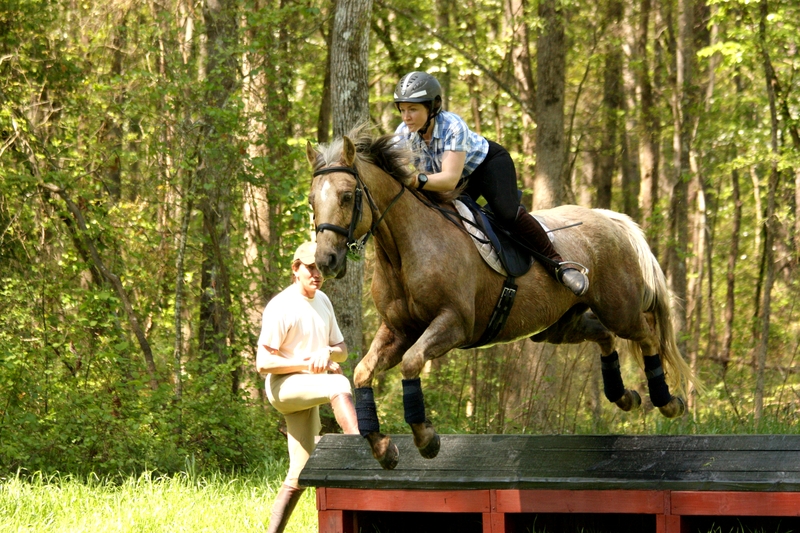 Certified Level IV, Reba excels in ‘plaisance,’ western obstacles and T.R.E.C. Translation coming soon! Jument croisée Ardennais et Canadien de 14m3, elle est née le 5 juillet 2012. Elle possède des allures vives et aime beaucoup travailler. Affectueuse, elle adore les enfants. Elle connaît les manœuvre jusqu’au cavalier IV et possède une endurance remarquable. 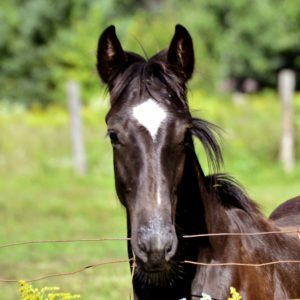 This bay Morgan gelding of 15h was born February 23, 2009. Gifted with a magnificent presence, he is comfortable and refined, with plenty of endurance. Sensitive and affectionate, he is light, sure-footed and eager to please.